Mad Catz is unveiling their new controllers for Street Fighter IV, a HAWX compatible flight stick and their latest PC flight stick at this year's Consumer Electronics Show. The Saitek Aviator Flight Stick comes in an Xbox 360 and Playstation 3 model, but both are fully PC compatible. The controllers include an oversized flat base for increased stability, three dedicated Fire Buttons, a Combat Trigger, POV (point-of-view) Analog Stick and a throttle lever. The controllers also include a two position mode switch. The 360 version includes an integrated Live headset connector and an Xbox Guide button, while the PS3 version includes a Home button. Mad Catz says the sticks are fully compatible with Ubisoft's upcoming flight sim Tom Clancy’s: HAWX. The sticks, which ship later this month, will sell for $50. 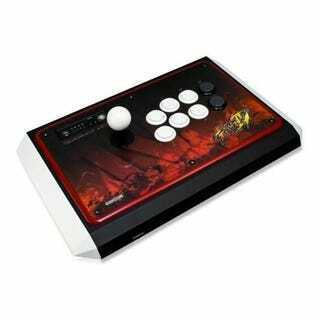 The Street Fighter IV Arcade FightStick for the Xbox 360 and PLAYSTATION 3 includes dual-speed Turbo functionality for each of the eight buttons complete with LED Indicators, and an integrated D-Pad switch. The start and select/back Buttons have been moved to the rear of the stick, which also includes a top panel that can hold character cards which show each character's special moves. The Street Fighter IV FightPad for the Xbox 360 and PLAYSTATION 3 includes an enlarged circular eight-way floating D-Pad and arcade style six-button configuration. An integrated D-Pad switch allows gamers to alternate between D-Pad and Analog Sticks. The Street Fighter IV Arcade FightStick: Tournament Edition for the Xbox 360 and PLAYSTATION 3 uses the same Japanese style ball-handled joystick and 30mm Action Buttons found in the official Street Fighter IV Vewlix arcade cabinet. The stick also has the D-Pad control switch, dual Turbo functionality for each button, and exact button layout matching the Vewlix Street Fighter IV arcade panel. The Street Fighter IV Faceplate and Console Skinz for the Xbox 360and Playstation 3 lets gamers customize their consoles. The Street Fighter IV Wall Scroll us basically a giant sticker you slap on your wall. The Cyborg X Flight Stick is a PC flight stick with a trigger, eleven programmable buttons, a shift function to double the program options, two levers and a scroll wheel. The X also uses some components which can be removed or folded away to make it easier to store the controller. The stick's handle attaches to the base with a secure screw collar and the left and right feet of the tripod base fold in and out of the body. When extended, the legs click into place to create a secure and stable platform for the stick. The stick, set to hit in the first quarter, will sell for $50. Am I the only one more than a little disturbed that Mad Catz still isn't telling us officially how much their Street Fighter gear is going to sell for? Sure, we've heard that the gamepad may sell for $40, the stick for $70 and the collector's edition for $140, but why no mention in their press releases?